Rob: Okay, welcome back to our Becoming Your Best podcast listeners. This is Rob Shallenberger, hope you’re having a fabulous day wherever you are in the world. Today we have a very special, amazing guest, Gloria Mayfield Banks. And you know, I’ve got to give huge kudos to her in the spirit of total transparency. We’ve done like 160 podcasts over the course of time and never once has there been an issue. Well, we did this like two months ago and for whatever reason, it simply didn’t record. And so she’s so gracious, so kind that this is actually take two for this podcast and this just is indicative of who she is and her personality. You may be wondering, why listen to this podcast? Well you’re going to quickly hear her story and understand how much she has to offer. If this doesn’t say it all, then I don’t know what does. She is ranked number one in Mary Kay in North America right now. You don’t just get there by accident. I mean, you have to be an amazing person obviously, to get to that type of point. She’s built an incredible team, she’s an amazing leader and she’s had quite the journey of her own and I’ll let her share that. She’s also written a book called Quantum Leaps: 10 Steps to Help You Soar. It’s awesome because it’s easy, it’s quick and very powerful tips that anyone can use to have a better life and really increase their confidence, their peace and everything that Becoming Your Best is all about. So with that being said, Gloria, welcome to the Becoming Your Best podcast again. Gloria: I am so very excited, Rob. Thank you, thank you, thank you for making this happen again. You know, I told you before that, oh, don’t you just hate it when things don’t work exactly like you thought they should. And then when you do it again and you recreate it, it turns out better. And is that always the way life is. 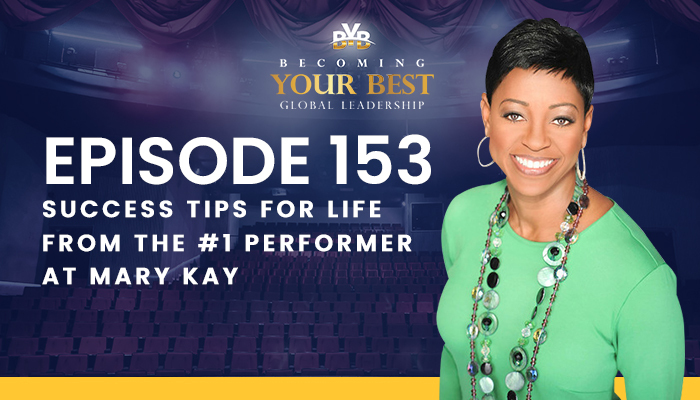 I love the title of this podcast, “Becoming Your Best” and I can promise you, all of us that have become our best is because we’ve done it over and over and over again. Rob: Yeah, that’s exactly it. I do believe there’s reason. Who knows why but maybe it’s just a conversation we’ll have here that we didn’t have there and you simply don’t know who needs to hear that and maybe it’s just us that needs to hear it. If you don’t mind Gloria, what I thought was really beneficial last time and certainly is for anyone to get more familiar with you is could you just share briefly your background, some of your experiences and what led you to where you are today because the story in and of itself is a powerful story? Gloria: Thank you Rob. I would love to share that. I want to share it in such a way that I hope to touch someone in some way. I always tell people, I’ve been doing a lot of this lately Rob is telling people to craft their story. All I mean by that is to tell the story because everyone has a story. Mine is one and I want to tell everybody I hope to connect with them on gloriamayfieldbanks.com, and I’ll give them my site as well again but I’m totally there, totally on Instagram and Facebook and would love to connect with them because I’m from Detroit, Michigan, born and raised in the Midwest. Grew up in a phenomenal house. My parents were just shy of 62 years when my dad passed. So we grew up in a home where my parents were very intentional about our self-esteem. And so therefore all four girls, am third of four, all of us are extremely successful entrepreneurs. It is sort of quirky. We’re in very different businesses but all of us are entrepreneurs. I grew up always working hard and always having a good time. And then when I was in the seventh grade, they found that I was dyslexic. So I always had a reading disorder and I will always have reading disorder, but my lesson to people is embrace whatever good you’ve gotten and whenever you didn’t first define as good, there’s a blessing there if you dig enough to find it. Dig stands for “Don’t Ignore God.” It’s in there. It’s in there. The blessing is in there. So I grew up dyslexic. I studied really hard anyway. Of course, when I was in high school, you do know Rob, I was a cheerleader. You do know I was the captain and you do know that we went to the championships and won. Of course. So that was my story. I went on to college at Howard University in Washington D.C., studied business and worked. I love working. I’m a self-proclaimed workaholic. I love to work. So when people say, “Well, Gloria, can you join our sorority?” I was like, “Oh no. I like work too much.” I learned about people skills while I was working at the grocery store. So I can tell you a little bit about that. Then I went on to work for Polaroid Corporation in Boston. While I was there, I applied to graduate schools and I attended Harvard University School of Business and got my MBA. I left from there and I started selling for IBM and became a top salesperson in my division. I was very excited to be in, what they called at the time, the 100% Club. I did that and then I moved from there and went back to school at Harvard and while I was doing admissions work for Harvard, I started and built my Mary Kay business. I just want to say this, Rob, and we can go deep if you’d like to, but I went from starting with the dream of making a little extra money for a gig on the side to a point where I am bigger as an entrepreneur than I ever dreamed because I had dreamed of taking the C-suite and working in corporate. So now, I am and all I do is train others about how to build a business, whether they want it small, medium or large, to take them on a journey called better. Rob: Yeah, it’s fabulous. I love what you’re doing. So bring us up to speed on where it is now. So from there, what brought you then to where you are now? So you have obviously built this enormous robust team, you’re an incredible leader, bridge that gap there from where you were at Harvard up to this point now. Gloria: Okay, I want to tell them that this morning I did an interview on the radio station and we talked about domestic violence. So when you go to Gloria Mayfield Banks and you read about me, you’re going to find that I was in 10 years of domestic violence. Once again, what I thought was a very dark, dark spot in my life which it was a very dark, dark spot has turned out to be something amazing that God has used because He’s allowed me to tell the story and inspire other people and I gained a lot of wisdom there. I tell you that because I really do believe, Rob, that it has been a huge part of my ability to build an amazing business. So I started this business to make some extra money. I had my first record breaking performance, like when I hit the company and blew it out of the water because I wanted to make a lot of money to support my life as a single parent. I wanted to go through divorce because I needed to because of domestic violence, but I didn’t want my children to suffer. So I want to tell people that it doesn’t matter what moves you as long as you get moved. So I became someone who was very clear about what I wanted to create because I knew exactly the kind of money I wanted to make and I backed into it with that. So I earned the use of my car within five months of building my Mary Kay business. I then decided to move into the position of directorship after falling off three times, Rob. When I tell you I know how to teach people, not just how to get back up but how to change their mindset because I had to fix my mindset because the company didn’t change, the product didn’t change, the rules didn’t change. I changed. I changed my mindset and that mindset took me to a place where I’ve racked in millions and millions and I’m proud to tell people about that because I teach people how to make real millions not just how to be successful but how to make real millions. One thing I talk about all the time is the short term sacrifice. Getting in my car, driving when others wouldn’t because they weren’t willing to be inconvenienced. I remember sharing the opportunity with people even if I thought they might say no. I shared it anyway. So it went from being an earner of a new car, to earning the pink Cadillac, to becoming what’s called an elite executive to the highest ranking, which is a national and then within the national position, you become an inner circle. Now I’m an international inner circle because my business is in the U.S., it’s in Mexico, it’s in Peru, it’s in Colombia, it’s in the United Kingdom and it’s in Canada. And so I built it in such a way where not only am I making millions, I’m most excited because I’ve helped so many other people make millions as well. Rob: Yeah, and that’s what I love. That’s the essence of leadership. Is when you can help serve and influence others and help them achieve their vision when you’re achieving your vision. I love this definition that I heard a few months ago that we now use in our seminars and it’s this. How you feel about yourself, when you’re by yourself is how successful you truly are. And one thing that I love about you Gloria, is that you just love where you’re at in life. You embrace it. You have a passion about this financially, personally, across the board and you’re helping others do the same for themselves. So, if you don’t mind, what I love is…You know, clearly with this background you’ve overcome, and I shouldn’t say overcome, you still are dealing with dyslexia and going through that. You’ve overcome this domestic violence situation or this abusive, you know, at home that you dealt with for years and yet here you are. So along the way, if you don’t mind, what would you say are one or two, and this is always one my favorite questions to ask because it takes a lifetime of experience to answer this question. And because we all have different experiences, rarely is the answer the same. So my question is, what are one or two lessons learned that you’ve learned along the way that have had a big impact on getting you to where you are now and helping you stay there? Gloria: I do love that question. So I want to answer it this way. I want to tell your listeners, number one is life happens to everybody. So one lesson is, frustration is misplaced expectations. And so life is going to happen to you. It’s not for you to get disappointed when life shows up, good or bad. It is being always on purpose with navigating. I did go through a divorce. I did get in that dark place where I was wondering if a relationship would be my fate and now I’ve been with my husband for over 22 years. We have a phenomenal relationship. He’s incredibly, incredibly successful on an international basis as I am and he sits on the Federal Reserve Board and on the boards of John Hopkins and the University of Maryland and he does a lot with helping people invest in the U.S. on an international scale. The reason I tell you that, Rob, is because another lesson that I’ve learned along the way is, no matter what it looks like right now, it will not always look that way. No matter what it looks like right now. And because I have always looked up and I’ve been completely aware of who feeds into me and how I handle what they give me, I’m very sensitive, Rob. I’m sensitive and I become sensitive to turning people off that are not feeding me what I want. If you can’t positively encourage me, then I can’t be in that space. And that’s what I mean when I’m completely sensitive to who’s around me because no matter what it looks like right now, it won’t look like this forever. Rob: That is fabulous advice. Do you mind if I just share a couple of thoughts on top of that? Rob: To be on this because I want to give you the bulk of the time in this podcast. Rob: Two things on that. Number one, you know that we’ve been researching what sets apart great leaders and high performers from everyone else. And by leaders, we mean really everyone because at a minimum we’re leading our own lives. So this is a very universal approach to leadership and that there are 12 principles of highly successful leaders. Well, what’s interesting is, these 12 principles are very predictive of success and what I started adding in there is how much more powerful are these 12 principles when we also put ourselves in the environment where you have other like-minded people helping you work towards focusing on those types of principles. Part of what you’re alluding to there is, if I understood you correctly and talking about your sensitivity to who you have around you in your circles, it’s not to say that, you know, we don’t help the people that need help or reach out to people in different ways. You know, you can serve whoever but when we’re talking about people who we invite into our close inner circle, our close friends, the people who we spend time with on a daily basis, they’ve got to be people who are helping us on the journey that believe, that are supporters of us rather than the cynics or the people that doubt and say, I don’t know if you can really do that. Our environment is very predictive of our success and that’s why you hear that old adage, you know, you become the five people that you spend the most time with or some variation of it. That’s one. Then number two is you’re talking about how…And in whatever capacity, what it looks like today may not necessarily be what it looks like tomorrow. We just finished our signature two day conference about three weeks ago and there we had the president of a large bank. He’ll probably listen to this podcast and he attended our conference about a year and a half or two ago with his wife. Well since then, that was probably 15 or so months ago if I remember correctly…They were driving to their cabin and their back right tire blew and their SUV rolled two or three times and he looked over and his wife was unconscious and she really hasn’t woken up in about 13 to 14 months other than just very brief interactions with facial expressions and things like that, she’s been in a coma since then. That’s their prognosis for the rest of her life as it stands right now. You just think that, you know, we have today and today looks a certain way but whether it’s in our business or our personal lives, things can change so quickly. It’s how we adapt to those changes that will determine our ultimate success or failure in life. You know, when you married your first husband, I don’t expect that you ever anticipated that it would be a relationship like that. And yet it evolved and then you came out of that. You could have let it destroy you, yet you faced it and it built you. So I don’t know if that captured the essence of what you were saying there but it’s just very powerful, a couple of those lessons that you shared and I hope that we all listen to that because at some point, they’re going to impact our lives in different ways. Gloria: Absolutely. You know Rob, when you are telling the stories and you’re talking about the essence of what makes a strong leader. And when everybody listens to this or shares this, I think it’s very powerful that when we get a podcast that we like, that we share that with other people because you never know whose life you may touch. And so when you talk about leading yourself at the very, very minimum, you’re going to do that. One of the things I talk about and I’m very passionate about is that for years as I was building leaders and years as I was creating my success, my success was determined by how many other people I could help become successful. So I always was looking for what’s the it factor? What’s the it factor? I’ve come to believe its confidence. And that’s why I spend so much time teaching other people how to develop their courage so they could build their confidence, so they can expand their choices, so that when life hands you whatever it’s going to hand you, you are in a position to make the types of choices you need to make to take you to the next decision. Rob: Yeah, I love that Gloria. So great comments. I can’t believe we’ve been talking for almost 20 minutes. I’m holding your book in my hand right here, Quantum Leaps: 10 Steps That Help you Soar. From that book you had these 10 steps and you just mentioned confidence which I see is one of them. If you had to choose one other that you said, you know, this could really have a big impact in your life which one would it be? It’s funny because when people ask me which of the 12 principles is the biggest, most important one to you? Well, every single one is important, it just depends on the phase of life you’re in. Rob: It’s a loaded question and I know that each one is powerful in its own right. What’s one though that across the board, you say, you know this one has a big impact. You just mentioned confidence. What’s one of the others? Gloria: Okay, so let me pick this one. It may or may not be the most important just like you said but it could be the most important to the person who’s reading it at the time. And since we’re talking about becoming your best, I’m going to pick what I call the stem of Quantum Leap. Skill management, time management, emotional management and money management. These four things, Rob, I believe will either cause you to soar in an upward manner or cause you to crash under frustration. When someone comes to you and they’re very frustrated, you can ask them whatever it is frustrating you, do you believe it is because you don’t have the skillset to take you where you want to go. You haven’t mastered your time management to fit it into the crevices of your life. You, emotionally, don’t understand how to handle what’s happening with you or where you want to go. Or you don’t know how to manage your money or you don’t have enough money to manage to get you there. It’s usually those four things. When you ask someone what causes them to soar, they can usually point to one of those four things as the primary thing. For me, I believe my primary gift is emotional management, of those four things. Because for me, managing my emotions has taught me how to handle money, has taught me how to handle my time and has taught me how to improve my skill. Different people use different things but that’s just one of the 10 steps that I have in that book Quantum Leap. I love the fact that you said that it’s an easy read because of course, since I’m dyslexic, there are no big words in that book. You know that, right? And they can get it at Gloriamayfieldbanks.com. They can get me at Gloriamayfieldbanks.com and that’s what I love about this. Rob: You know, I just barely found something here. I’ll just say this book reminds me a lot of something that Simple Truth would do. And I looked at the back and sure enough, Simple Truths. Gloria: Exactly. Exactly who did it. Came after me for four years. Four years he said, you gotta write a book! And I said no! I’m not writing a book. I’m dyslexic. The last thing I’m going to do is write a book. I’ve since written two books but he said to me, well, I’m dyslexic and I own a book company. I was like, “Okay dokey, I will write a book,” and that’s what happened. Rob: Don’t you love it? Walt Disney said, it only seems impossible until it’s done and here you’ve done it. I didn’t know that the founder of Simple Truths was dyslexic as well. Gloria: It’s that crazy. That crazy step. Gloria: Mac Anderson is crazy. He’s crazy and he is magnificent. Rob: He is magnificent, and I love a lot of things that he’s done. So Gloria, I love the things that you’ve been talking about. You know, we’ve kind of hit a wide swath in just a very short amount of time. From the acronym STEM, which I really like that. I’ve never heard that said that way before. To confidence, to the circle of people that we surround ourselves with, our environment and being sensitive to who we allow into that circle of influence in our lives. This has been impactful because the truth is, if every one of us look introspectively at our lives these are questions that we need to be asking ourselves. Who are we allowing into our lives right now? Are our current circle of friends lifting us moving us forward or holding us back in a certain way? You know, where’s our emotional intelligence? Part of this emotional intelligence that you’re talking about, really encompasses a lot of areas. I know that your background and experience has allowed you to become a master in this arena. How many times are there people that we are still holding onto this hate or anger for, we haven’t forgiven them and it’s only going to be a cancer inside of us? This is emotional intelligence. Or how can we blame others? You know, as soon as we start looking inward and not becoming the victim of our circumstance, then we can really start moving forward. That only can be done with a high level of emotional intelligence and the ability to set aside our ego. Gloria: Oh my gosh, we can talk about ego and ego management forever. When I tell you forever and when people really understand…So glad you brought it up and I don’t think we’re talking about enough. You know, there’s waves of things that we talk about? And there was a time when people would talk about egos all the time. I think that we let it become a very quiet topic and we need to bring it back because when you really understand what ego means and where it can and cannot serve you, you’ve mastered something that’s very powerful and wise about how to live your life. Rob: Yeah, where it can and cannot serve you. That’s well stated. I like the way you said that, Gloria because the truth is we all have an ego and there’s times where I like your confidence. You’re right, we could talk about this for a long time. You know, I was a fighter pilot for 11 years and as I looked at some of the very best pilots, they were high in confidence and high in humility. They knew that that jet could kill them at any given moment. That was a sobering humility that they always walked out to that jet with. At the same time, they were confident. The best fighter pilots were confident yet humble. The ones that scared me about flying with them, and there weren’t very many of these. I mean, you could say there’s a lot of ego, and there is some in the fighter pilot world, but when it came to the actual flying itself, it’s the humble, confident pilot that had the most trust in. It was the one whose ego was so big that it wouldn’t allow them to make the correct decisions in the air that scared me. How many times does that happen to us in life where our ego, the unhealthy side of our ego, gets in the way, the pride? We don’t do things because we don’t want to acknowledge it. You know what, maybe I wasn’t right there. It just can be such an impediment to success for so many of us. It’s there for all of us. We just have to acknowledge that it’s there and then how do we tame that beast? Gloria: Exactly, exactly, exactly. How to use it correctly and how not to use it correctly. You know, sometimes it’s the ego that allows you to speak to someone in a positive attitude when at first you didn’t feel like it. Like, okay, I’m just going to walk by this person. But the ego is also the one that reminds you that give joy to other people and be acknowledged for it. But if you use it too much to your benefit, it becomes a detriment to you because of that. So I love the way that you say that because it really can make such a difference for someone and it can also hurt you. Rob: Well, here’s an example you serve. Principle 5 of the 12 principles is to live the golden rule. In other words, treat people right. Create a world class customer experience when you’re talking about business. Here’s an example of ego. If we’re doing something to simply be kind and help another with no thought of reward, with no hidden accolades or agenda behind it, it’s just simply to help another person get to a better place, that’s powerful. If we’re doing something with the intent of, I want some sort of accolade or reward for this, that’s ego driven and there’s always going to be let down because either the name won’t be recognized from the stage. They didn’t say thank you and thereby it was a letdown because it didn’t feed the ego. And it was the wrong motivation. Whereas, if we do something with no…I’m just using service in this example. If we serve someone or help someone get to a better place with no intent or thought of recognition or reward or accolades, there’s nothing to feed, there’s no ego. It’s just you’ve helped someone get to a better place and there’s a feeling that comes with that. With the other side of that coin, looking for the accolades or the feeling, if it’s not fed the exact way that we want to be fed, there’s a letdown. Gloria: And there’s no way for you to be open to see if the blessing is coming differently than you expected because you’ve blocked it with your expectation that it didn’t come the way you thought it should and therefore you can’t receive it at all. Rob: Oh, that’s a good one. I like that. Well, I can’t believe we’ve been going for like 27 minutes. So Gloria this has been filled, funny and interesting but this has been a totally, like 100% different podcast than the first one we did. Rob: Which doesn’t surprise me. So you never know why things happen. If you wouldn’t mind, remind everyone one more time, how can they find you? Any social media or website links that they could use to find you. Gloria: I would love that. I would love that Rob because I want them to know that I’m open and I want to connect with them. So the first place that I always tell people is to please join me at Gloriamayfieldbanks.com. It’s easy to find Gloriamayfieldbanks.com. I’m on Instagram, @gloriabanks. I’m at Twitter @GloriaBanks. I’m also on Facebook, Gloria Mayfield Banks and I have a special group for women that want to be stronger, smarter and more successful and that’s called The Power Huddle. So I really look forward to working with them. I do two shows on my Facebook that I’d love to tell them about. One is called Secure the Bag, which we talk specifically about increasing their focus and their activity to increase their income and then I have a master class that talks to them about how to become super bad all day long. Super bad all day long, because I do not want them to miss an opportunity to be unapologetically powerful, and how to do it. Rob: You’re awesome Gloria. It’s been an honor again to visit with you. I’m so glad we did this the second time because it was a totally different experience in content. I think our listeners will get a lot from you. And for those that continue to follow you, hopefully this will be the beginning of a great relationship. You know, ironically, with relationship, sometimes it can be very one-sided and you don’t even know people are following you and suddenly they kind of share something that you said or did that had a big impact. We’ve all been on both sides of that equation. Rob: So thank you Gloria. Rob: Any parting comments or thoughts? Gloria: I just want to tell everybody that this is the time to think about what they’re going to do in the next 12 months. My parting thoughts with everyone is, let’s take a short term sacrifice so when you look back on your life, 12 months from now, it will look totally different than it does right now. We don’t want to miss a moment, not one moment of changing in the direction of our dreams. Create your best self. Rob: Oh that’s awesome Gloria. Well, as we wrap up, thank you so much Gloria for being on the show. As a reminder, to all of our listeners, if you haven’t already taken the Personal Productivity Assessment go to Becomingyourbest.com and right there on the homepage, you enter your email and that will take you into the 25 question assessment that gives you very specific steps on how to increase your score move forward and really increase your confidence, peace and happiness in life. So if you haven’t done that already Becomingyourbest.com. Take your Personal Productivity Assessment and that will start moving you forward towards doing the things that we’ve been talking about on this show. Thanks again Gloria, we hope everyone has a fabulous day and we’ll talk with you again next week.